Titan is one of the largest moons in the Solar System. In fact for many years it was thought to be the largest of all the moons. However, it has a thick atmosphere, and that atmosphere makes it appear a little larger than it actually is. The way in which radio signals from Voyager 1 were cut off as it passed behind Titan in 1980 showed that Titan is actually slighter smaller than Ganymede, making it only the second largest moon in the Solar System. Despite this demotion, if Titan were orbiting the Sun on its own it would be a respectable planet. With a diameter of 3200 miles it is over twice the size and ten times the mass of Pluto. In fact it is even larger than Mercury, although only 40% as massive because it is made of ice and rock, whereas Mercury is made of iron and rock. Titan is unique among the moons of the Solar System in having a thick atmosphere. Its atmosphere contains about ten times as much gas per square foot of surface as the Earth's atmosphere, and even though its surface gravity is only about one-seventh of the Earth's gravity, the surface pressure (which is equal to the weight of the atmosphere, or the amount of gas in the atmosphere multiplied by the surface gravity) is about one and a half times greater than that of the Earth's atmosphere. Because of the low gravity and the large amount of gas, the atmosphere extends about ten times further into space than ours. 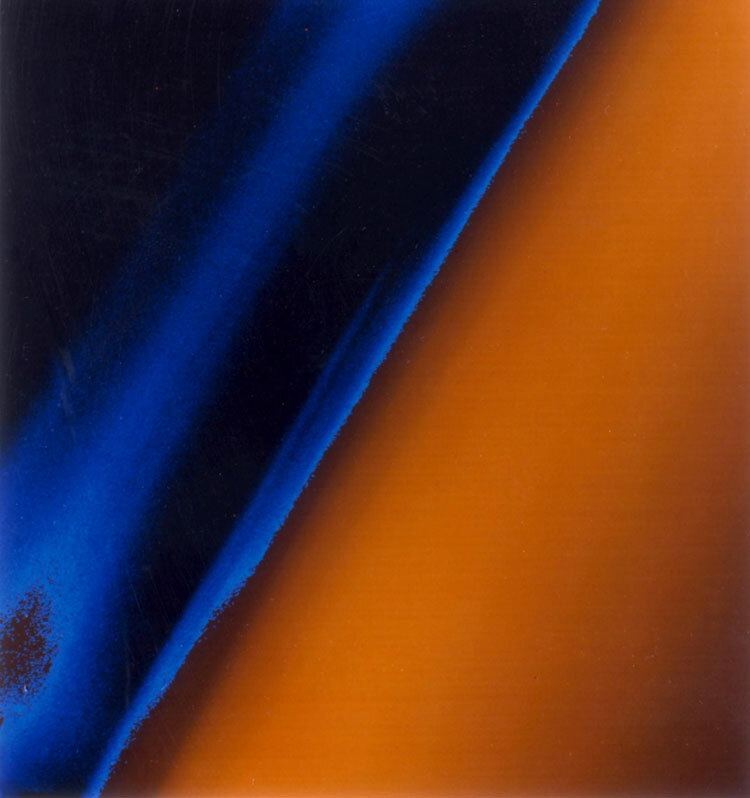 Thin blue haze in the upper atmosphere of Titan lies above thick orange haze. The atmosphere and haze layers extend more than 300 miles above the surface. Large portions of Titan's equatorial regions are covered by "sand" dunes. The sand is probably grains of hydrocarbon compounds which are piled into dunes by the prevailing winds (though recent observations show than some dunes can form and change in very short periods of time, presumably as a result of much stronger than usual winds). As on the Earth the Coriolis effect due to the rotation of Titan creates zones parallel to the Equator in which the prevailing winds blow one way or another. On both Earth and Titan winds near the Equator primarily blow toward the west, and at higher latitudes winds primarily blow toward the east. Because the Earth is larger, it has an additional region of westward winds nearer the poles, and on the even larger Jovian planets, there are several additional regions of eastward and westward winds; but on Titan only the two patterns of major wind circulation exist. Given the westward motion of the atmosphere near the equator it would be expected that dunes would be sculpted accordingly; but rather oddly the dunes appear as though they were sculpted by eastward-blowing winds. Until very recently, this was a mystery. But a new theory based on seasonal changes in the direction and strength of the winds seems to explain the matter. The image above (Image credit NASA/JPL/Space Science Institute/Planetary Photojournal) presents a map based on Cassini observations of equinoctial winds. Note that the winds are toward the east rather than westward, as is the normal case near Titan's equator. The image below (Image credit JPL, JSC, ESA, NASA, Cassini Radar Mapper, apod100810) is a cropped and contrast-enhanced portion of an image of Titan's sand dunes. Individual dunes are about 300 feet high, half a mile wide and stretch for hundreds of miles nearly parallel to Titan's equator. 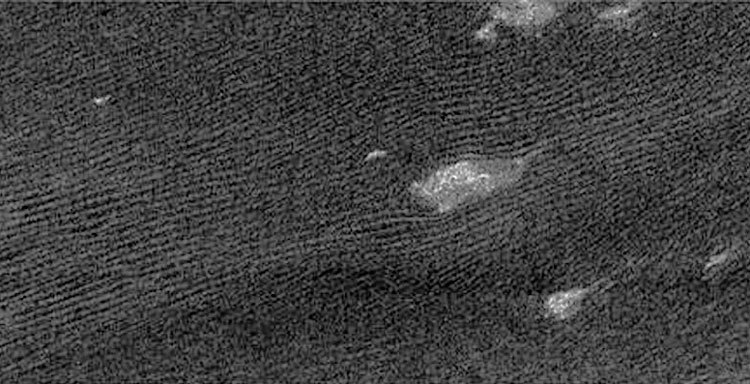 Huge swaths of such dunes cover about 20% of Titan's surface, mostly in the region within 30 degrees of its equator. 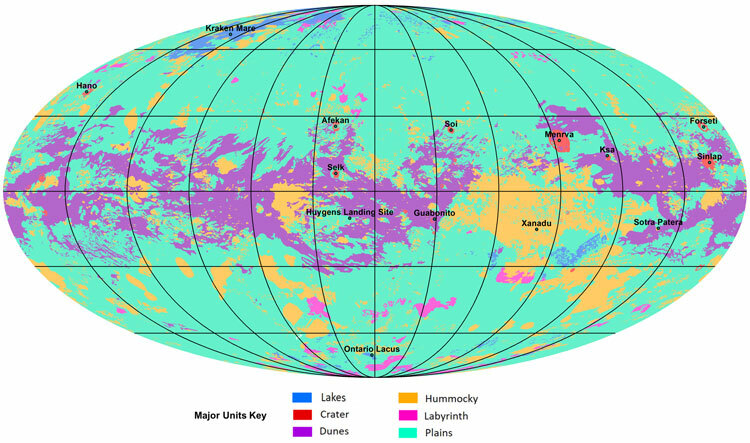 Infrared map of Titan based on 1994 observations with the Hubble Space Telescope. Lighter and darker features are presumably mostly actual surface features (lighter areas being icy continents and darker areas hydrocarbon-rich basins). 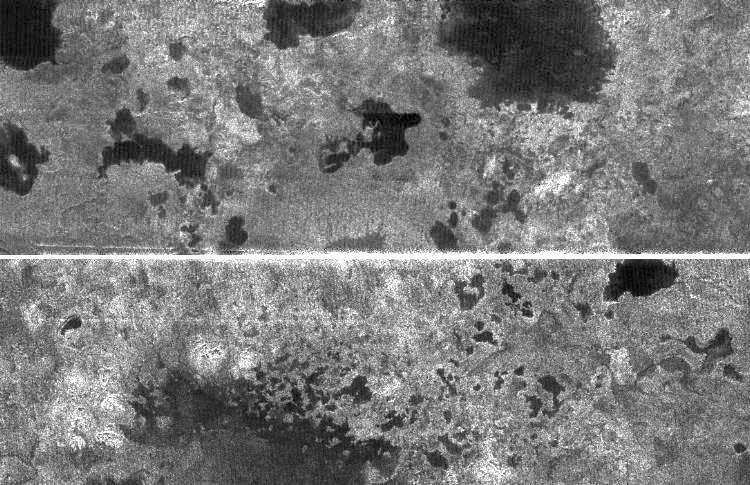 The map covers latitudes within about 45 degrees of Titan's equator; the area shown is approximately 9000 miles by 2300 miles. The atmosphere of Titan is thought to be very similar to the early atmosphere of the Earth, and the presence of large amounts of complex organic compounds such as hydrogen cyanide, which is a precursor of life, makes scientists wonder whether Titan may harbor primitive lifeforms. 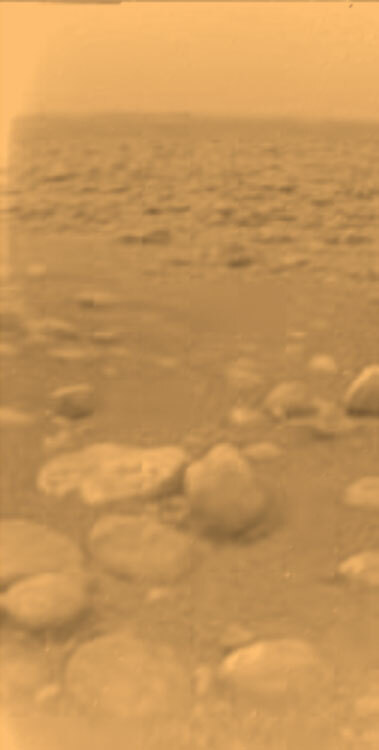 Even though its very low temperature (discussed below) makes that somewhat unlikely, that is one of the exciting possibilities that was studied by the Huygens lander, which parachuted into Titan's atmosphere around the end of 2004. Radar imaging by the Cassini spacecraft and surface observations by the Huygens lander answered a few questions about the atmopshere and surface of the moon in the area near the landing, but raised more questions than they answered. 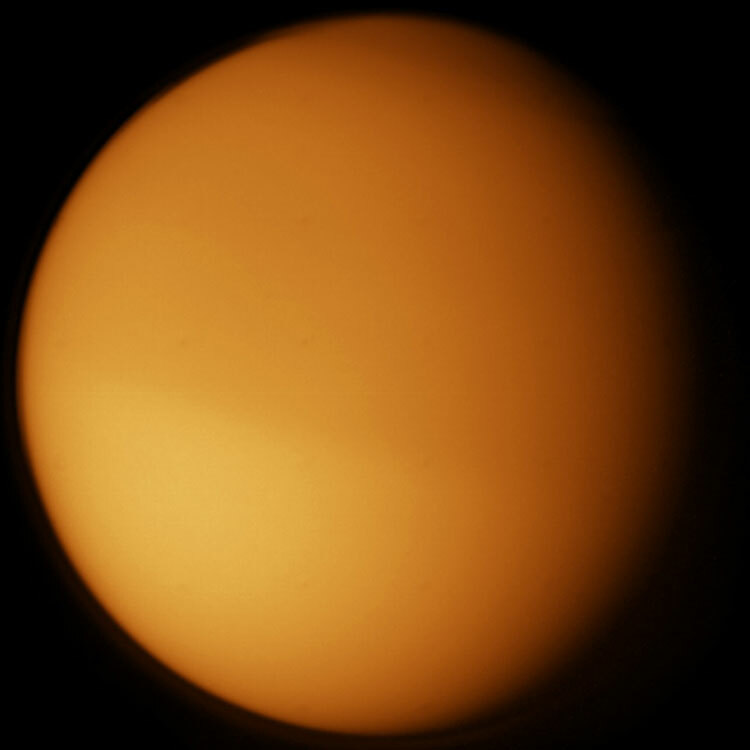 Titan is able to have an atmosphere because it is relatively large and relatively cold, with surface temperatures around 290 degrees below zero Fahrenheit, and temperatures in the upper haze layers around 150 degrees below zero (the haze layers are warmer because of the heat that they absorb during the photochemical processes that produce the smog-like compounds). However, Ganymede and Callisto, the two largest moons of Jupiter, are about the same size as Titan and only about 30% warmer, so they are theoretically just as capable of holding onto an atmosphere, and neither of them has any substantial amount of gases. This makes us wonder why Titan has an atmosphere, while the other two moons don't. The most likely explanation of this difference is probably due to a difference in the composition of ices inside the moons. Because Jupiter formed closer to the Sun, where it was somewhat warmer, volatile ices would have been relatively rarer, and Ganymede and Callisto's ices are probably mostly water ice. 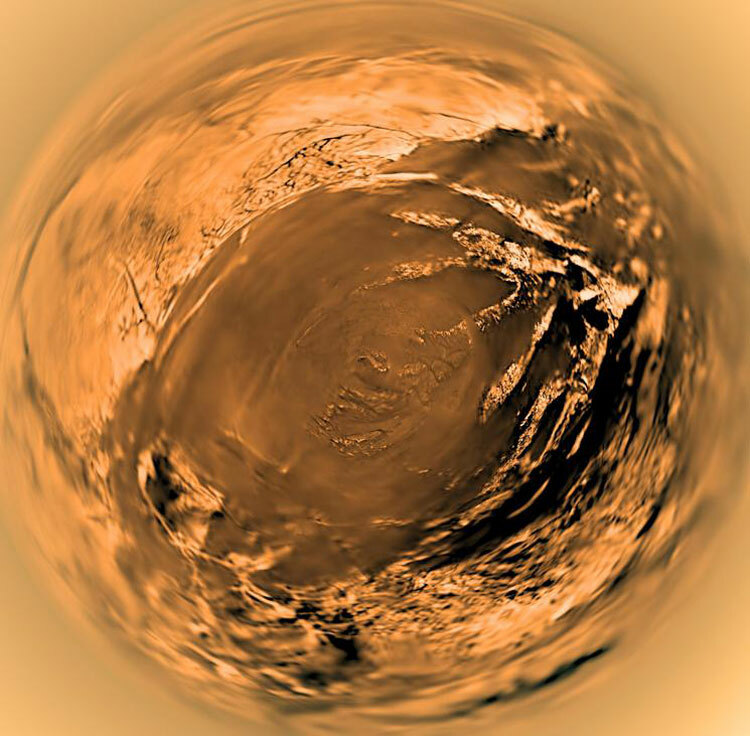 Titan, forming around Saturn, which is twice as far from the Sun, in a region which was somewhat colder, although also containing substantial amounts of water ice, would have had a chance to accumulate large amounts of more volatile ices. During the early history of the Solar System, as radioactive materials contained within the rocky materials of various bodies began to heat them up and melt them, the evaporation of ammonia and methane ices would have produced a thick atmosphere of such gases. Over a period of time, absorption of ultraviolet radiation would have split off the hydrogen gas (ammonia is made of hydrogen and nitrogen, while methane is made of hydrogen and carbon), and as the hydrogen escaped into space (because anything smaller than a Jovian planet doesn't have enough gravity to hold onto such a light gas), what was left behind was the present atmosphere of nitrogen and argon, and a residue of carbon and hydrocarbon compounds. Since Ganymede and Callisto wouldn't have had nearly as much of the more volatile ices, they probably just didn't have the chance to form much of an atmosphere, and the fact that they could hold onto an atmosphere became irrelevant. One question about Titan's atmosphere is how it manages to maintain its concentration of methane. Theoretical calculations indicate that the loss of hydrogen gas to space and the chemical reactions which convert methane and nitrogen into heavier hydrocarbons which sink to the surface of the moon should remove all of the methane now in the atmosphere in a relatively short period of time (about ten million years, which seems like a long time, but is very short compared to the age of the Solar System). As a result there must be a continual replacement of the methane, presumably by the evaporation of methane ice from the interior. Titan's internal structure is unknown, but its density is almost twice that of water ice, which would imply a nearly equal mixture of ice and rocky materials. Heat generated by radioactivity within the rocky materials is probably responsible for the replenishment of methane gas in the atmosphere, but whether the heat was adequate to allow Titan to differentiate, like Ganymede, or whether Titan is more uniformly mixed, like Callisto, is not known. 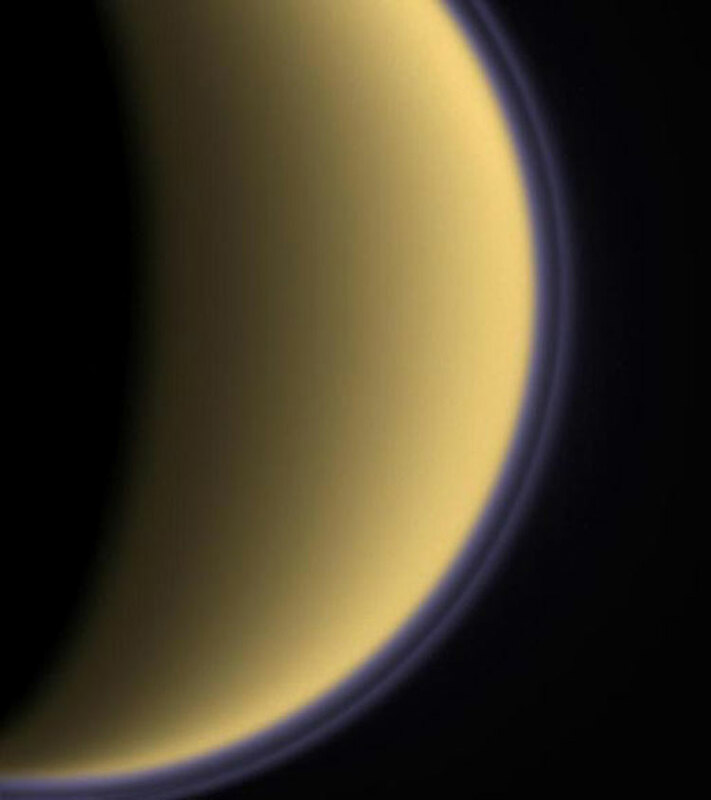 The Cassini spacecraft should resolve this uncertainty, but in any event Titan is not likely to have a substantially liquid region within its icy interior, because it does not have a magnetic field. As is true of many of the moons in the Solar System, Titan rotates synchronously, meaning that its rotation period is the same as its orbital period around Saturn (just under 16 Earth days), and it always keeps the same face towards Saturn.